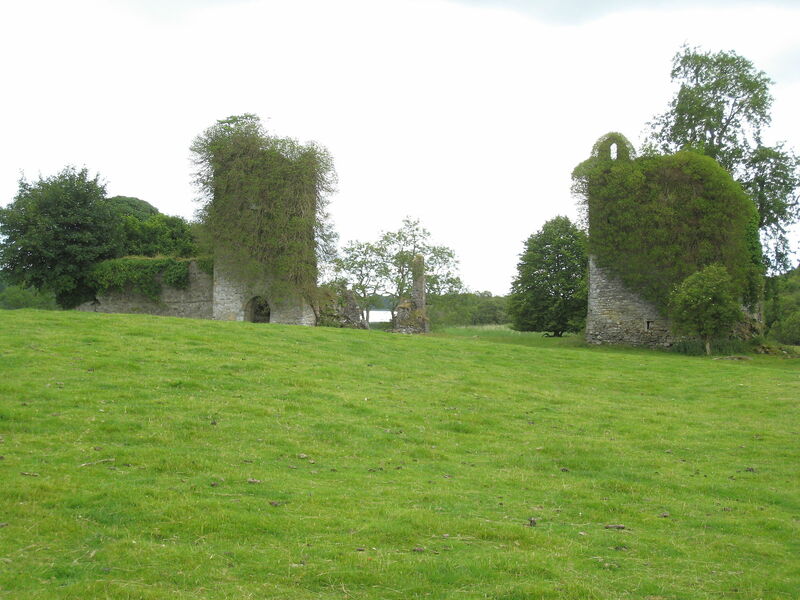 From Castlebaldwin, just northwest of the lough, a minor road leads west to Ballymote, famous for its strong castle, flanked by six corner towers. Built in 1300 by Richard de Burgh, the ‘Red Earl’ of Ulster it became a bone of contention in the Civil War, when it was occupied and defended by Irish forces in 1641, only falling into English hands in 1645, after the united attack of Ireton and Coote. The remains of a Franciscan friary are also here. The late 14th century Book of Ballymote, containing a genealogy, classical literature and local history was compiled here (it has been kept in the Royal Academy since 1785). Tubbercurry is a small market town with one long street. The 8th century Moylough Belt (a belt-shrine, now in the National Museum, Dublin) was found near the castle and church at Bunnanaddan. Achonry, just north of Tubbercurry is the seat of a bishopric founded in the 7th century by St. Nathy. Opposite, at the foot of Knocknashee, with its hillfort, is the ruined Franciscan Court Abbey, with a square tower. Descend into the valley of the Owenmore, with Templehouse Lough on the right. The ruins of a castle, said to have belonged to the Knights Templar are in the Templehouse estate. Beyond the bridge a minor road leads left to Coolaney, where a curious bridge spans the Owenbeg. Moymlough Castle, nearby, is a ruined O’Hara stronghold (their more recent seat is at Annaghmore), an attractive demesne on the Owenmore. Ballymote and Tubbercurry are both hidden gems that are worth a visit on your tours of Ireland. Why not contact Ireland & Scotland Luxury Tours to organise your trip now?